A Guilin fun guide and Yangshuo hotels review, by Jane McLean and Sara Yin, and more from Smart Travel Asia and Dancing Wolf Media. 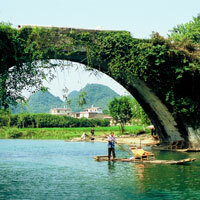 The best way to see Guilin is to pass through. 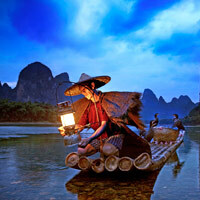 Savour Yangshuo, the cormorant fishermen, serene river cruises, and stunning limestone outcroppings. DISREGARDING our puzzled protest, the taxi driver accelerated, in the wrong direction – he wasn’t happy with our hotel plans. “Why do you want to stay there?” he shouted, “I’m going to take you to Lifeng Hotel. Much cheaper!” The fellow was a determined negotiator and something of an F1 fan, but we stuck to our guns as our taxi careened across narrow roads, and finally got to our intended hotel. It’s the journey, not the arrival, right? At such moments it’s hard to imagine ancient Chinese poets feeling inspired by modern-day Guilin. Legendary for its colourful limestone peaks—or karsts—and misty rivers, Guilin is now overrun by tour buses, diesel smoke and far-too-savvy locals like our neighbourhood taxi driver. Mainland tourism is at an all-time high as China’s growing nouveau riche look for an escape from the urban bustle, and an ever-increasing influx of visitors is cramping the serene style of China’s most prized landscapes. Still, Guilin - literally “forest of sweet osmanthus” - is a charming city of unique natural formations, lots of shopping and is in close proximity to the scenic and far more appealing town of Yangshuo. Development is happening fast – at last count, inhabitants numbered 4.7 million. Pay a visit before the remnants of charm disappear for good. Chinese Renminbi can be exchanged at the airport, hotel, or at the many banks and currency exchange stalls (US$1 = Rmb6.21). 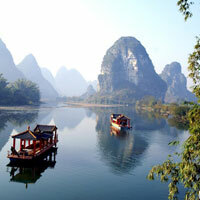 March and April are the best—and busiest—months for travel to Guilin and Yangshuo. This is right after the winter rains and the air is clearest. It is also rice-planting season, so there is lots to look at in the verdant countryside. Between July to September, temperatures can run up to 38 degrees Celsius and you’ll be swatting mosquitoes with a vengeance. On then to our Guilin guide and fun stuff for all comers. Dragonair and Hong Kong Airlines fly directly from Hong Kong, and other international services take off from Macau, Japan, Thailand, Taiwan, Singapore and Korea. There are domestic flights into Guilin from Beijing, Chengdu, Kunming, Shanghai, Shenzhen, Guangzhou, Shantou, Xi’an, Zhuhai and many other major Chinese cities on China Southern, China Eastern and Air China. The once-sleepy Guilin Liangjiang International Airport is friendly with English subtitles everywhere. But don’t expect much English spoken here. The airport also has a small business centre with Internet available for a fee. If you have time for a nap (and a spare bit of cash), check in to the VIP lounge with complimentary refreshments and large leather couches. Ceiling-to-floor windows in the departure gate overlook a line of karst formations. From the airport you are a 40-minute and approximate Rmb100 cab ride away from Guilin’s city centre. The driver will—as all of ours did—try to sell you tickets to various attractions and hotels. Unless your mandarin is slick enough to bargain, politely decline. Head to a local CITS (www.cits.net), the largest network of English-speaking travel agents in Guilin and its surrounding towns. Practically every English-speaking guide you meet on this trip belongs to CITS. Agents here can almost always get you a lower rate than any officially listed for hotels and tourist attractions. 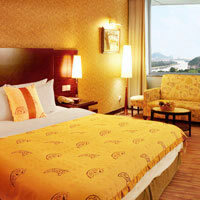 Guilin hotels are cropping up everywhere but only a few are of the four or five-star standard. The five-star Sheraton Guilin Hotel’s location can’t be beat: one side faces the Li River boardwalk, the other side faces the Guilin Centre Square (see attractions) which combine blocks of shops, bars and cafés. The Sheraton’s high-ceiling lobby and coffee shop, contemporary décor, three restaurants, and well-appointed rooms with marble bathrooms look no different from any other Sheraton in Asia. There’s a mini-bar, complimentary wired broadband Internet (WiFi available in the Club Lounge), plasma-screen TV, in-room safe, branded ‘Sheraton Sweet Sleeper’ bed, and weighing scale for good measure. Top-level ‘Premier Suite’ rooms have floor-to-ceiling windows. Exploring Guilin by bicycle may not be everyone’s cuppa, but there are bikes for hire (and an outdoor pool to cool off in afterwards). The only other international offering, the Shangri-La Hotel, Guilin is popular with both business and leisure travellers, located near tourism hotspots, and 10 minutes from the International Exhibition and Conference Centre. There are 449 super-spacious rooms and suites with floor-to-ceiling windows revealing city or garden and river views. Executive river view rooms have outdoor terraces with the karst landscape in the distance. In-room business facilities are top-notch with full-size desks, electronic safes, multi-media hubs, and complimentary WiFi. When work is done, kick back with a CD or DVD on the 37-inch television, grab a tipple from the mini bar, and nestle into the feather pillows on the beds. Non-smoking rooms are available. There are five restaurants and bars, one of which is by the outdoor swimming pool. Also explore an indoor swimming pool, outdoor tennis courts, a health club, Jacuzzi, sauna and steam rooms, plus a spa. This hotel is spacious and comfortable with picture perfect grounds and offers almost every amenity in the hotel book – a fine choice for a pleasant stay in the city and one of the better addresses in our Guilin hotel review. Mark it down on your Guilin corporate meetings list. The regal sounding Guilin Yi Royal Palace, located on the West Ring Road, has a traditional garden as its central focus. Interiors are also traditionally styled. 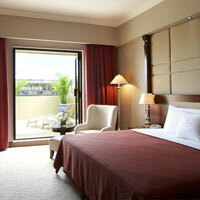 Rooms are large with wireless Internet, flat-screen TV, in-room safe, and mini-bar, and most have views of the garden. 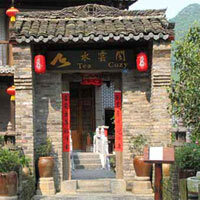 There is a restaurant and old-style teahouse, also with fine garden views. The Guilin Royal Garden Hotel is another large, relatively bland offering located on the Li River opposite Fubo mountain. Its ‘five-star’ status is perhaps debatable, but its 330 smallish rooms are adequate with aircon, Internet, in-room safe, small television, and minibar. There are convention and business facilities on site, and three restaurants helmed by hotel’s self-proclaimed ‘famous’ chefs. Down the road there’s the popular three-star Hotel Universal, where communicating in English is a serious challenge – booking a room online may be difficult too as the website is predominantly in Chinese. Rooms are basic but clean and spacious with complimentary tea and coffee, and complimentary broadband. Guilin’s self-titled “best” hotel is the ostentatious Lijiang Waterfall Hotel. The name comes from the 72m manmade waterfall that flows from the top of the hotel to a ground-level pool and, in 2002, flowed straight into the Guinness Book of World Records. At the Lijiang you can make an educated guess of the owner’s favourite colour: gold. It’s everywhere. Lijiang caters to wealthy mainland businessmen by the looks of the clientele milling around in its enormous lobby, with a feng-shui-friendly centrepiece in the doorway. The 652 rooms here are bigger than most and come fitted with beige or gold décor, a mini-bar, Internet, flatscreen TVs, and safe. There’s a lavish suite ‘for the president’, and a separate bed and suite ‘for the First Lady’. Interesting. Also interesting are the mini swimming pools, purportedly used specifically for massage, and the thermal swimming pool – described as a “pure land in a busy city”. The meaning may be lost in translation, but it sounds relaxing nonetheless. Dining options in the Lijiang Waterfall abound, catering for both eastern and western palates. Situated a stone’s throw away from the Lijiang and likewise surrounded by bodies of water is the more modest Guilin Bravo Hotel (formerly the Holiday Inn Guilin). The lobby is impressively high with massive windows and friendly English-speaking staff. On sunny days the lobby turns off its lights, allowing sunlight to serve its purpose. Rooms are decorated in faux-European furniture, but there’s free Broadband, in-room safe, mini-bar and weighing scale. Two restaurants feature local and international fare, and there are four function rooms for events. A small fitness centre looking on to an outdoor pool, sauna and beauty salon complete the picture. The Lijiang and Bravo hotels are good choices if you want parks at your doorstep rather than city bustle. 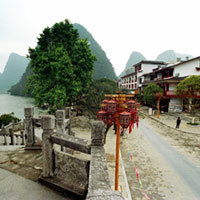 But if you prefer a good mix of buzz and peaceful Li River views, check into the Sheraton, Shangri-La or Hotel Universal. Or ask your neighbourhood taxi driver for some advice. He’ll give it anyway. Enough yakking about hotels—you’re going to Guilin to spend your time outdoors, right? There are options to suit all sorts, be it the mid-range shopper, café yuppie or sedentary stroller. For the latter Guilin is filled with quaint parks and lakes that begin to look indistinguishable after a while. Start at Elephant Hill Park along the famous Li River, where you can walk through a massive structure resembling an elephant and visit a pagoda on top. Bring small notes for the entrance fee. Then stroll down the Li River boardwalk, a wide stretch of pavement offering grand views of the city and its karst hills backdrop. As you gape at your surroundings, watch out for slow walkers, small tai chi gatherings and badminton matches. Tummy rumbling? Step off the boardwalk at any point and walk cross Binjiang Nan Lu. This sidewalk is filled with cafés, restaurants and bars. Guilin’s signature dish is Guilin mi fen, where a smorgasbord of flavourful toppings is thrown on top of a mound of white rice noodles. Cafes with free Wifi are everywhere. The homey Gourmets Coffee Café (tel: 210-6880, 18 Binjiang Nan Lu) is operated and serviced by Milton, a Taiwanese-American who is generous with his advice of things to do and see. Nearby you can saunter through a well-lit Chinese bookstore called Dao Feng Bookstore (tel: 288-3817) that plays quaint European tunes in the background. Also on Binjiang Nan Lu is a nod to the epic Lord of the Rings trilogy, Shire Hobbiton Café. Not quite Middle Earth, but there is coffee, pastries and pleasant views of activity on the Li River. Minutes from Guilin’s main centre on Zhonghua Road, KAYA coffee house offers a slice of Jamaica (the café was named after a Bob Marley album) with reggae music, art exhibitions and, of course, coffee. One block West of Bin Jing Nan Road is the ever-crowded Guilin Centre Square, with hundreds of small shopping vendors, mini-malls and ice cream stands. A bit of car honking too. Don’t expect anything high-end here however: it’s not far off from what you may see along Hong Kong’s youth-friendly Granville Road or Bangkok’s MBK—at a fraction of the price, of course. Back on the boardwalk, mid-way through you can cross a bridge to the east bank, a residential area lined with bourgeois townhouses. Hop into a cab to the Seven Star Park, a 298-acre plot filled with hills, caves, relics and streams. The Hua Bridge inside is a 1,000-year-old stone walkway with five giant arches underneath. Well worth a stroll. Your kids might drag you through a tired-looking zoo and Children’s Amusement Park, though. The Reed Flute Cave is a six-kilometre drive from the city centre and its gorgeous multi-colour stalagmites often grace Guilin brochures. But we found it turned really “photogenic” once the artificial lights came on. Still, it’s a pretty site and an easy 240m walk, if you don’t mind all the artifice. Around two hours’ drive north of the city are the 650-year-old Longji Terraced Fields (also called Longsheng Terraced Fields), stacked with rice paddies. Visitors can climb up the mountain (or take a cable car) to one or all of three rural villages inhabited by Yao and Zhuang minorities. After you’ve had your fill of Guilin’s honking cars, it’s time to escape 20km south to the backpacker town of Yangshuo. The place has been carefully preserved by the government to retain its huge tourist appeal. For instance buildings cannot be higher than six storeys lest they block the stunning landscape and, best of all, no taxis are allowed in. The journey can be a worthy tourist attraction in itself if you go with a four-hour cruise down the Li River. The boat drifts at snail’s pace, so bring a book if you’re the restless sort or just plant yourself on the top deck for spectacular, close-up views of limestone outcroppings. Tickets can be purchased through CITS – it is more expensive for the upper deck (Rmb450) and a mediocre lunch is included. Many first-time travellers coming from Guilin take the boat one way and a bus back (or vice versa). The Yangshuo to Guilin bus route is clean, cheap and bumpy. Buses depart every fifteen minutes and take no longer than 45 minutes to complete the journey. Alternatively a cab ride from the Guilin International Airport to Yangshuo costs about Rmb250 or more. You can even bypass Guilin completely by taking a sleeper bus from Guangzhou, Hanoi, Chengdu and a few other small cities. But despite the pretty photos of the bus interior, don’t expect to get a good night’s sleep. 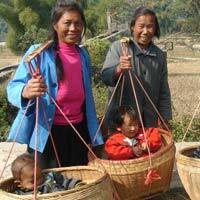 Beds are small and cramped, and the roads leading to Yangshuo are often very bumpy. Because of Yangshuo’s reliance on backpackers, accommodations come in either cheap hostels or ‘luxury’ three to four-star hotels. This is what any Yangshuo fun guide will focus on. But things are changing. Taking sleepy Yangshuo by storm - in a quiet and elegant manner of course - is the 142-room Banyan Tree Yangshuo (opened October 2014). On the banks of the Li River, the hotel is built in a traditional courtyard style with two-storey buildings resembling a local village with filigree windows and sliding wooden doors, sloping grey-slate shingle roofs, laundered white walls, and manicured gardens. Each room offers luxe fittings and panoramic views. Expect spacious surrounds with woody interiors, soaking tubs, brushwork paintings, and several Chinese touches. This is a top drawer retreat for the well heeled with a pleasingly rustic touch. A key feature here is the extensive range of spa treatments, something the Banyan Tree brand is well versed in. Pick from an east-meets-west menu or opt for something different like a Rainmist Spritz. Banyan aims to set a local benchmark as one of the best Yangshuo luxury hotels and this is no idle boast. The Yangshuo Mountain Retreat is a charming eco-friendly inn, with a philosophy based on simplicity, serenity and care of the local community and villages. The lodge offers a direct transfer service from Guilin Airport for Rmb300. Facilities have been upgraded since the inn first started operating – there is now air-conditioning and even WiFi. 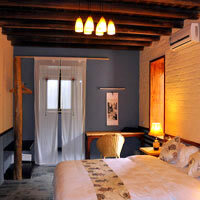 Rooms align with the eco concept and have locally made bamboo furniture throughout. There is not a TV or telephone in sight. The restaurant offers local specialties with ingredients sourced from nearby villages. Five percent of the retreat’s annual profits are donated to the Chinese-US Medical Foundation, helping children with brittle bone disease throughout China. Elsewhere in Yangshuo, whichever route you go, bear in mind that depending on the season you can press for less than half the listed rate by simply walking into a hotel or dealing with a local travel agent in Guilin or Yangshuo. Also on the top of the list in our Yangshuo hotel guide is the Paradesa Resort Yangshuo, a four-star compound of villas. Paradesa is conveniently located on one end of West Street and next to the bus station, but far enough from West Street to block out the pulsating music that switches on at night. Rooms are spacious, clean and bright with beige hardwood floors and light-coloured furniture. No mini-bar, safe or in-room Internet connection. However there is a tiny business centre with a computer and fax machine. Also within the Paradesa is a local food restaurant, art dealer and fitness centre. C Source West Street Residence is housed in a 260-year-old traditional courtyard building with Chinese décor that oozes charm. It is on West Street so expect some noise. Rooms can be dark and the hotel controls the water temperature… but if you like a bit of character, this is the place. Note that there have been a few name changes, which may explain the lack of a website at time of writing. Also on West Street is the slightly more boutique Rosewood Hotel, with 23 rooms decorated in traditional Chinese style and equipped with Internet access, aircon, TV, mini bar, and Western-style bathrooms. Most rooms have a balcony. Its sister hotel, the Rosewood Inn, is in a quieter alley, just off West Street, with similar Chinese touches throughout its 25 rooms. The Rosewood group (this is not the US-based luxury hotel group some may be familiar with) is owned by two brothers originally from Hong Kong. Rosewood has stamped its mark all around town not only with hotels, but also restaurants and cafes. The Tangrenjie Hotel is a 500-room luxury hotel with ancient Chinese influences everywhere. A 15-minute walk from West Street, Tangrenjie is a tranquil option overlooking a quieter part of the Li River. Peer out the window for breathtaking views of the Li River and karst landscape. Rooms are airy and clean and come equipped with Broadband, mini-bar, safety box and staple amenities. There is an outdoor pool and four restaurants. A less-expensive but very nice Yangshuo budget hotel option is the sleepy guesthouse, River View Hotel, and its slightly more deluxe sister, the River View Grand right next door. Fun fact: Sun Yat Sen made speeches in the space to the left of the properties. Together the two-storey inns contain less than thirty private rooms, some with balconies, and all with aircon, TV, Internet, and Western-style bathrooms. There’s an affordable restaurant downstairs and computers available to use in the lobby. The village of Jiuxian, about seven kilometres from Yangshuo town, is the location of the Secret Garden Hotel, a boutique offering in beautifully restored Qing Dynasty buildings. Preservation and conservation of the surrounding environment is high on the agenda, but design and feng shui principles are integral to the feel of the property with antique furniture and local artwork throughout the space. The 11 rooms have aircon, in-room safes, complimentary WiFi and spacious bathrooms. A series of courtyards and gardens compliment the hotel’s facilities that include a restaurant, library and art gallery. This is a fine Yangshuo boutique hotels pick. Mark it down. About ten minutes drive from Yangshuo’s West Street on the banks of Dragon River is the quaint Yangshuo Tea Cozy, which opened in 2012. Nestled in paddy fields and surrounded by karst peaks, this small property is particularly appealing for tea lovers with its specialty teahouse. The 12 rooms have bamboo furniture throughout, wooden balconies and lovely views. There are also flatscreen TVs in each room, and complimentary WiFi. An organic vegetable garden provides the restaurant chefs with some of their produce and guests may dine on the rooftop with panoramic views of the countryside. For simple, if atmospheric, lodgings in the Ming style look at the grey-brick Yangshuo Hidden Dragon Villa sited around five kilometres from town. Sweeping mountain and rice paddy views abound at the roof garden restaurant while interiors offer a sprinkling of traditional wooden furniture, latticework, and period artefacts. In the 14 rooms, expect a simple wooden bed and chest of drawers, television, Wi-Fi, and a Chinese tea set. Rooms offer river and village views, the former being the more prized. Yangshuo Village Inn in touristy Moon Hill is the self-proclaimed ‘first boutique hotel’ in Yangshuo. There is a three-storey main building with accommodation and a rooftop restaurant as well as a lovingly-restored farmhouse at the rear with five rooms. Each room has floor to ceiling windows, a balcony, handmade bamboo beds (with electric blankets in winter), Western-style bathrooms, and local art on the walls. ‘Luna’ is the on-site rooftop restaurant and specialises in Italian food. On then to our Yangshuo fun guide. Deciding where to go in Yangshuo is one of the toughest decisions you’ll ever make, given that the entire town caters for tourists. There are “attractions” everywhere. How to choose between intriguing names like Xiongsen Bear & Tiger Mountain village or Moon Hill Town or the Shangri-La park? One of the best ways to see Yangshuo’s sprawling countryside is by purchasing a map and renting a bike (around Rmb20-Rmb30 for a day) or a scooter (around Rmb120-Rmb150) from one of the ubiquitous travel centres on West Street. You’ll find fields of oranges, cotton, peanut and rice, depending on the season. For those hoping for a glimpse of Yangshuo’s famously verdant rice paddy fields, ask your travel agent beforehand when the rice is harvested: this is done twice a year and the fields turn brown and weedy after the rice has been plucked. Most guidebooks focus on the many stunning rock outcroppings and serene bodies of water that offer ample opportunities for the outdoor enthusiast. You should too. Finally, here’s your chance to go rock climbing, kayaking, rafting, canoeing, caving, mud bathing and more. Or, if you’re feeling indulgent, drift away in a hot air balloon for an hour (around Rmb1,500 per person). Hobbyists may also delight in the variety of quick classes you can take, such as calligraphy, cooking and even acupuncture. Or watch the fishermen trawling for catch at night, aided by their sharp-eyed accomplices – cormorants. The birds certainly know a thing or two about fishing. The Real Water Cave is Yangshuo’s answer to the Reed Flute Cave in Guilin (or is it the other way around?) Why is it ‘real’? A big warning sign greets you at the entrance, ‘IMPORTANT! There are many Fake water caves…” with eerie-looking photos of pasty bodies covered in mud (part of the mud bath option you’ll see later). Tours are two-and-a-half hours long, or you could spend the entire day underground with prices starting at Rmb250. Decline the ‘water shoes’ on rental, which are actually flimsy rubber sandals. Unless you’re in stilettos, you’re safer in your own shoes. After all you’ll be walking three kilometres of narrow, rickety bridges, slippery rocks and occasionally ducking low ceilings. Like ancient poets, the tour guide pauses every now and then to point out the ‘dragons’ and ‘Buddhas’ among the rock formations. Midway through you can opt for a splash in the natural mud pool. Yangshou’s Night Impressions Show is a surreal experience. The stage is the Li River while flashing neon lights are projected onto surrounding karsts for dramatic effect. Performances include hundreds of singing, torch-bearing children, or a long line of fishermen waving red banners. Hard to believe it was directed by Zhang Yimou, one of China’s most famous directors. The show gets tons of publicity though, so if you’re unsuspecting you’ll probably wind up in the outdoor amphitheatre among thousands. There are several ticket prices but the cheap ones are farther back and offer a more panoramic view of the strange hour-long show. Grab a bike or scooter to Moon Hill Park, where you can view a unique karst formation that appears to have a natural half-moon carving underneath. Adventurers can even climb on top. Directly underneath Moon Hill is a ‘traditional’ village— catering for tourists—with lots of outdoor fruit vendors, touts and restaurants. The Luna restaurant at the Yangshuo Village Inn serves up Italian fare if you need a change from the local delicacies. If you’re the planning sort, classes and outdoor excursions can be booked through your hotel or the many touts that greet you at the Yangshuo bus station. West Street, the biggest street in the town centre, is a chameleon of a strip. By day you can trawl through its many vendors and European-style cafes that often double up as hostels and travel agencies. Food options are dizzying, and every establishment appears to serve an American breakfast (eggs, waffles, Bloody Mary…), Yangshuo’s signature ‘beer fish’ and a medley of Chinese and Western staples. Among the shops here you’ll find fake Prada, paintings, cheap jewellery and Hard Rock Café t-shirts (though Yangshuo doesn’t have a HRC). Don’t buy anything for more than half the original price offered. West Street completely changes at night. The laidback cafes transform into live music venues or discotheques, which can’t be easy on the hostel guests upstairs. Discover the meaning behind Hard Seat Café where pulsating ’90s tracks beckon you off your seats. Or dine alfresco at Jimmy’s Café where you can get a huge plate of beer fish for a cheap price. 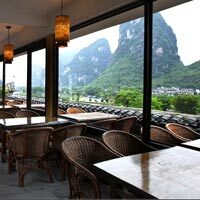 Bellevue Café & Restaurant borders a quiet part of the Li River and offers spacious patio seating with a decent meal. Kelly’s on Guihua Road near West Street is lively with cheap nosh, and gets good reviews from the multitude of travellers that eat here. Cloud 9 is a traditional Chinese sit-down place, which serves beer fish, while Le Votre on West Street is standout for its large, candlelit outdoor seating area, French food and homemade beers. If West Street’s blaring lights begin to irritate, head North to the next parallel street, Die Cui Lu. What Die Cui Lu lacks in shops it makes up in dining options. If your whole trip begins to feel a bit pork-and-fish-heavy, step into Pure Lotus Vegetarian Restaurant on Die Cui Lu for fancy Chinese vegetarian food. And that pretty much concludes our Yangshuo guide. Speed through Guilin and spend some seriously good time here in Yangshuo. Stay luxe or in a chummery. There’s choice for all wallets. Both Guilin and Yangshuo hotel rates vary from season to season and day to day. In Yangshuo especially, you can get rates at a fraction of the ones advertised by simply walking in and bargaining or going through a large travel agency such as CITS (www.cits.net). A cash deposit is often required when you check in, often no more than a couple hundred yuan. Several hotels can be booked online where the best available rates (BAR) are listed. Always check these with your own local travel agent. November to February are the coldest months and considered the low season. The renminbi (or yuan) exchange rate is US$1 = Rmb6.21. Guilin Bravo Hotel. Tel: [86-773] 289-8888, fax: 289-3999, (e-mail: glhi@public.glptt.gx.cn or www.glbravohotel.com). Guilin Royal Garden Hotel. Tel: [86-773] 568-8888, fax: 568-6888, (e-mail: dyxsb@public.glptt.gx.cn or www.glroyalgarden.com). Guilin Yi Royal Palace. Tel: [86-773] 258-6888, fax: 390-0899, (e-mail: guilinyi@live.com or www.guilinyi.com). Hotel Universal. Tel: [86-773] 282-8228, fax: 282-3868, (e-mail: htlunivs@public.glptt.gx.cn or www.huglcn.com). Lijiang Waterfall Hotel. Tel: [86-773] 282-2881, fax: 282-2891, (www.waterfallguilin.com). Shangri-La Hotel, Guilin. 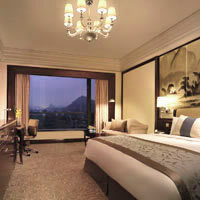 Tel: [86-773] 269-8888, fax: 269-8887, (www.shangri-la.com/guilin/shangrila/). Sheraton Guilin Hotel. Tel: [86-773] 282-5588, fax: 282-5598, (e-mail: sheraton.guilin@sheraton.com or www.starwoodhotels.com). Banyan Tree Yangshuo. Tel: [86-773] 322-8888, (e-mail: reservations-yangshuo@banyantree.com or www.banyantree.com). C. Source West Street Residence. Tel: [86-773] 882-9489. Paradesa Yangshuo. Tel: [86-773] 882-2109, fax: 881-6888. River View Hotel. Tel: [86-773] 882-2688, (e-mail: service@riverview.com.cn or www.riverview.com.cn). Rosewood Hotel. Tel: [86-773] 881-3321, (e-mail: rosewoodyangshuo@yahoo.com or www.yangshuorosewood.com). Rosewood Inn. Tel: [86-773] 881-3918, (e-mail: rosewoodyangshuo@yahoo.com or www.yangshuorosewood.com). Secret Garden Hotel. 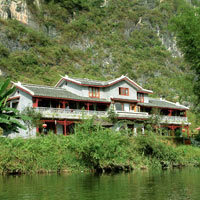 Tel: [86-773] 877-1940, fax: 877-1932, (www.yangshuosecretgarden.com). Tangrenjie Hotel. Tel: [86-773] 881-8999, fax: 881-8998, (e-mail: ken_lo_jie@hotmail.com or www.trjhotel.com). Yangshuo Hidden Dragon Villa. Tel: [86-773] 881-6268, fax: 888-5058, (e-mail: reservations@yangshuocountrysidehotel.com or www.yangshuocountrysidehotel.com). Yangshuo Mountain Retreat. Tel: [86-773] 877-7091, (e-mail: reservations@yangshuomountainretreat.com or www.yangshuomountainretreat.com). Yangshuo Tea Cozy. Tel: [86-773] 881-6158, fax: 881-6178, (e-mail: yangshuoteacozy@gmail.com or www.yangshuoteacozy.com). Yangshuo Village Inn. Tel: [86-773] 877-8169, fax: 881-8299, (e-mail: reservations@yangshuoguesthouse or www.yangshuoguesthouse.com).